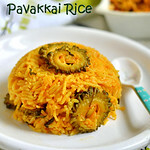 Bitter gourd biryani/Pavakkai masala rice -Yeah,u heard it right .Its an easy,yummy biryani recipe using bitter gourd.If you love bitter gourd like me,u must try this rice.It tastes super flavorful with mild bitter taste.When i was looking for this week’s Sunday Biryani Recipes,my MIL suggested me to try this biryani by reading this recipe from a Tamil Magazine.Initially i was hesitant to try this worrying about its bitter taste but she also told suggested me a method to remove its bitterness.So i tried it confidently & the result was unbelievably great with a very mild bitter taste only in pavakkai pieces and not in rice at all.Raksha took two servings of this rice without knowing it had pavakkai.U can make it very easily in busy morning hours as it has no grinding job and pack it for your lunch box too.But soak the bitter gourd pieces in curd+salt mixture and refrigerate it overnight so that u can prepare this biryani instantly in the morning.You can also use vinegar as suggested in the original recipe.But squeeze n rinse the bg thoroughly to remove vinegar smell.Bachelors & working women can try this biryani if u love bitter gourd recipes.Try n share your feedack with me.Lets see how to make this yummy bitter gourd biryani. Wash and slice the bitter gourd pieces thinly.Remove the seeds if any OR If u like the crunchy taste of seeds,retain it.Take half cup of sour curd.Add some salt,mix well and soak bittergourd for 30 minutes.Similarly wash and soak the basmati rice in water for minimum 30 minutes.Chop the onions,coriander & mint leaves and set aside. After 30 minutes,squeeze the bitter gourd pieces very well using your hands and discard the curd mixture.Take the bitter gourd pieces alone in a plate. Heat oil in a pressure cooker base and put the cinnamon,cloves,biryani leaf,kalpasi. Add onions and saute for a minute and then add the ginger,garlic paste. Mix well for few seconds and add the mint+coriander leaves.Mix it.Now add the turmeric powder & red chilli powder,salt.Lastly add the squeezed bitter gourd pieces and saute well for a minute till it shrinks a bit.Add little more oil if needed. 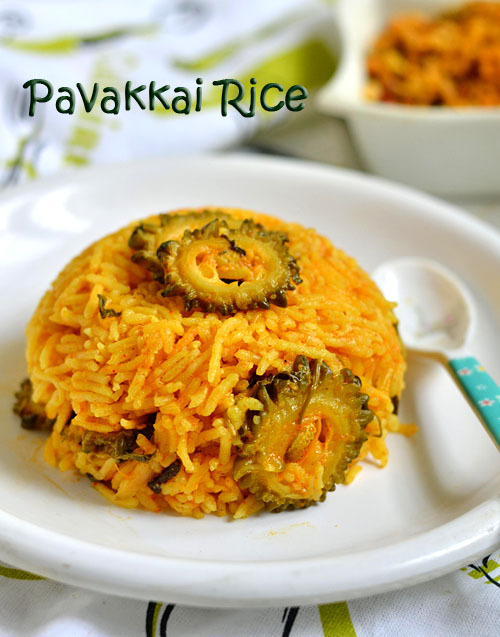 Now add the soaked basmati rice without water.Add 1 cup of milk and 0.75 cups of water.Add 1/2 tbsp of ghee & 2 tsp of lemon juice in water.Check for salt & spiciness.Pressure cook in low flame till one whistle..It takes 8-10 minutes.Remove & fluff with a fork after the steam is released.Serve it hot with onion raita. Add more chilli powder if u want extra spicy taste.The quantity i have mentioned here would be just right. U can also add 1/2 tsp of biryani masala powder or garam masala powder for more spicy flavor. I have used milk + Water.U can also use coconut milk for more richness. Do not skip mint & coriander leaves as they lend a spl fragrance. I used freshly ground ginger,garlic paste.U can use store bought too. Soak basmati rice for minimum 30 minutes to get lengthy rice after cooking. 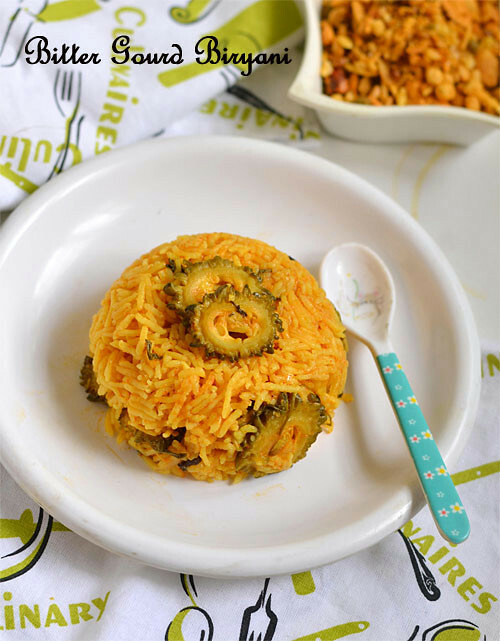 Try this unique and healthy bitter gourd biryani.It tastes yum with simple onion raita ! Def in for this biryani(I hate to eat bitter gourd).Recently tried soaking them in water,that too will remove the bitterness. How clever! I never thought about adding bitter gourd to biriyani. This is so interesting. Thanks, great post. excellent post ! thanks ! Bitter gourd is a different idea for briyani... Will definitely try it. I never tried regular milk too though most of my pulav I pretty much follow this recipe. A totally different idea...never thought to try briyani with bitter gourd...looks very goood! 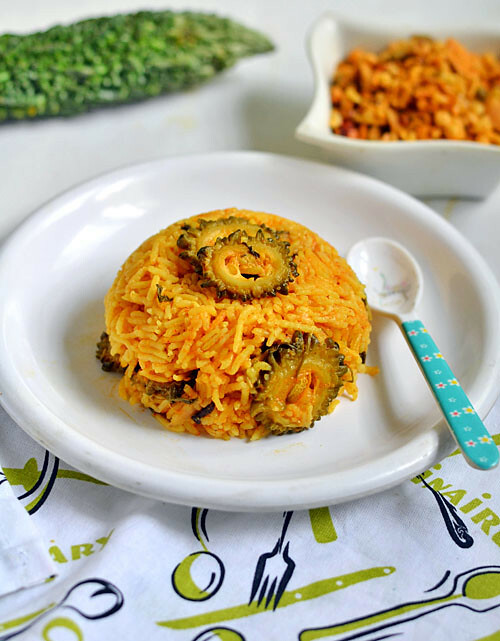 Bittergourd biriyani sounds so innovative and looks delicious too.. Always had bitter gourd curries never had bitter gourd biryani, looks yumm!! Thank u so much Ramya for trying and taking time to write here :) I am sure your feedback will make everyone to try this recipe :) Thanks again !